Generate a random multilabel classification problem. In the above process, rejection sampling is used to make sure that n is never zero or more than n_classes , and that the document length is never zero. Likewise, we reject classes which have already been chosen. The total number of features. The number of classes of the classification problem. 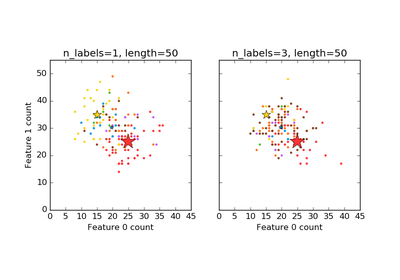 The average number of labels per instance. 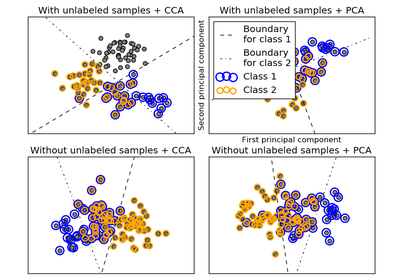 More precisely, the number of labels per sample is drawn from a Poisson distribution with n_labels as its expected value, but samples are bounded (using rejection sampling) by n_classes, and must be nonzero if allow_unlabeled is False. The sum of the features (number of words if documents) is drawn from a Poisson distribution with this expected value. If True, some instances might not belong to any class. New in version 0.17: parameter to allow sparse output. If dense return Y in the dense binary indicator format. If 'sparse' return Y in the sparse binary indicator format. False returns a list of lists of labels. If True, return the prior class probability and conditional probabilities of features given classes, from which the data was drawn. The probability of each class being drawn. Only returned if return_distributions=True. The probability of each feature being drawn given each class. Only returned if return_distributions=True.